Two years ago, I sent a mail with a picture from my barn-find P1. Now, the bodywork is 99% finished. You can see some pictures in the attachment. Now the body ironer cleans the chassis with sand (sorry, I don't know which is the right word), then paint it. When I take new photos from her, I send them for you. 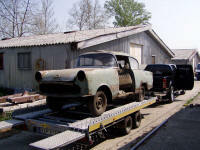 I have an Opel Olympia Rekord P1 car, and needs to be restored. Sorry, but I speak a little bit of english. I need some parts for this work. 7570 Barcs, Köztársaság u. 11.